The Honeywell 3800g is one of the top-selling scanners of its class. Exceptionally aggressive scanning, high durability, as well as easy handling make it ideally suited for the most diverse applications at the cashier desk, in the office, or also in workshops, storage, shipping, the laboratory, or in production-related environments. The linear imager is robust as it is fast, thereby guaranteeing swift and secure scanning of 1D and GS1 barcodes. The high-resolution camera guarantees particularly reliable scanning, even for badly printed, damaged, or uneven barcodes. Aside from its scanning performance, the ergonomics of the Honeywell 3800g also impresses with innovative features: the housing as well as the trigger are designed in such a manner that both right and left-handed users can easily operate the scanner. Due to the lighter weight, even longer usage is non-fatiguing for users. An optional scanner stand affords freehanded scanning from two positions. 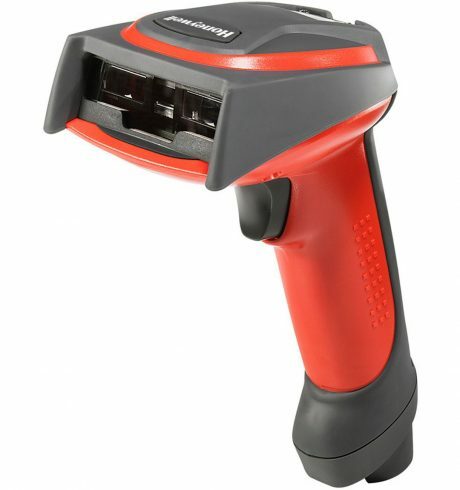 The imager technology offers additional advantages for scanning of 1D and GS1 barcodes, with which the Honeywell 3800g markedly improves employee efficiency when collecting data. The standard version scans barcodes at up to 270 scans per second and at a distance of up to 46 cm. The patented Adaptus Imaging Technology 5.0 is leading the way in processing scanned information, even from badly printed or damaged codes. Different versions of the linear imager provide you with the necessary flexibility to have the proper solution at the ready for multiple applications: The 3820 wireless Bluetooth version guarantees exceptional mobility. It transmits scanned information directly to the host from an operating range of up to 10 m. Up to seven handheld devices communicate with only one station, reducing costs and simplifying the design of the infrastructure. The 3800gPDF version also scans stacked barcodes such as PDF417, composite or micro-PDF barcodes. With the 3800gHD model, you can scan small and high-density barcodes, which in particular have become widespread in the production of electronic components, in automation, but also in jewellery retail sales. Enjoy particular flexibility through the scanner’s multi-interface, which you simply adjust for the required connection. The scanner is thus connected via the USB, keyboard, or RS232 interface of the PC.